Here is a photo of a Silkie named Cotton. 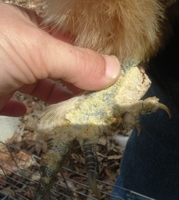 She has scaly leg mites on her toes. The mites also damaged her toenails. You can easily identify the mites by the raised scales on Cotton’s middle toes. There are pictures of a severe case of leg mites at the end of this article. 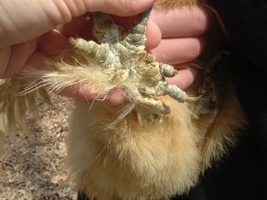 Scaly Leg Mites (Knemidocoptes mutans) usually live a protected life under the scales on the legs and feet of poultry but they do occasionally attach to combs and wattles. 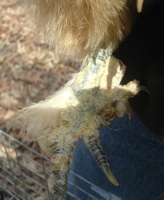 The scales thicken on infected legs and feet and seem to point directly outward; scales on uninfected birds lay so flat you might not notice them. Severely infected birds can become lame and die. 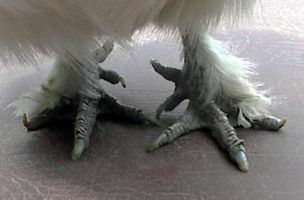 Like many mites, scaly leg mites spread by direct contact with infected birds and their surrounds. These small parasites are barely visible, live by sucking blood from their host, and can live several months without food. Isolate the infected birds. Clean the coop and optionally spray it with a miticide. If you can remove all the mites and their eggs, the miticide is unnecessary. Liberally apply petroleum jelly (Vaseline) or vegetable oil to the entire legs, shanks, and feet. Repeat every few days until the bird sheds the raised scales, new scales are full sized, and the new scales lay flat like on an uninfected bird. This method is safe and effective. Some people give Ivomectrin orally or subcutaneously to poison the mites. I have no experience with this method.